Hope everyone is fine and had a good weekend – mine wasn’t bad. 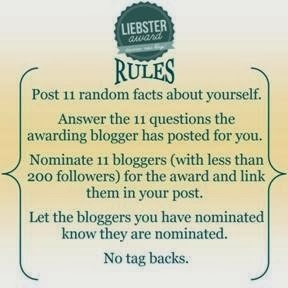 So I was nominated three times for a Liebster Award (I’m i lucky or what!! Hehe…) by some blogging sisters – Dolce, Lori and Suprina. Ladies i really appreciate the nominations – For y’all to think of me, is very kind of y’all. God bless!! Below are the answers to your lovely questions. Also, i’ll pass on the rules regarding this Award as this is actually my fourth nomination all together. Pardon me for this – don’t be mad at me pls!! 🙂 My first nomination was Here. Do you ever go thrift/vintage shopping? = Never done both before. Sum up how you would describe”Fashion” in 5 words or less? = Individuality, fun, comfort and low budget. Why and when did you start blogging? = Its a combination of boredom/inspiration/education and started a year ago. What makes you happy? A lot of things – exp. music, my son, blogging, etc. etc. If you could choose whom you like to marry someday, who will it be? = Jesus, because He can be trusted wholesomely. Describe yourself in just one or three words. = Simple, fun and friendly. What’s your dream? = Just do the right thing and be happy in life. What’s your favorite food? = Spaghetti!! What are your thoughts for the future? = Just hoping for the best. What is your favorite dish? = Spaghetti! The best place on earth you think? = I don’t know, cos i haven’t been to a lot of places on this earth. What is your favorite skin care product? = Dove lotion. Which are the top 3 blogs you love? = I love em all, sorry! Your latest favorite song? = Bisa Kdei – Baba (A Ghanaian Artist). Which is your favorite clothing brand? = I got a lot of them; Asos, Boohoo, George, F&F, etc. etc. If you were someone else for a day then who you would like to be and why? = Anyone with money, so i can shop for a day. lol!! What events or activities scare you? = Skydiving and Bungee jumping. Thanks to the fabulous sisters who nominated me and to all the fantabolous friends to this minimalistic blog.